Instructions for using RSS. Please edit rss.description.top. 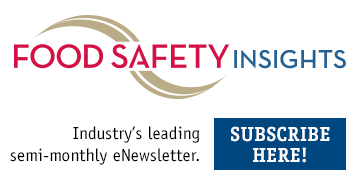 USDA-FSIS regulatory news and analysis will appear in this section. Any content dealing with FDA rules and regulations will appear here. The Food Safety Modernization Act (FSMA) is a regulatory change that touches many food segments. Improper labeling of product is a major cause of many recalls in the industry. Content pertaining to food safety in organic products will be the focus of this section. The non-GMO movement has processors' attention, but what about the safety of those products? As science improves, how are treatments making food safer? Without proper hygiene, employees can contaminate product in the food plant. Keeping things clean and in good repair is a primary step toward food safety. The rise in recalls due to undeclared allergens should cause alarm for processors. Regular audits can keep food processors honest when it comes to best practices. What are food processors and operators doing to prevent cross-contamination? Foreign-material contamination in food is a big concern as machines take control of processes. Pathogens are public enemy No. 1 in the fight for food safety. Keeping employees up to speed on food safety requirements is key. What can businesses do to communicate that their food safety practices are top-notch? Testing has gotten faster and more finely tuned as science speeds ahead. Unwanted guests can destroy a product, plant or company. Following the technological advancement in cooking systems. Finding and removing foreign material in food is a challenge science is tackling. 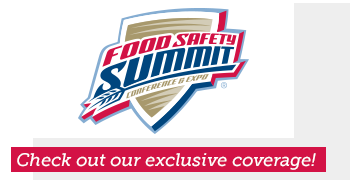 The latest strategies and tactics for keeping food processing and safety standards high. Wide-ranging innovations help packaging maintain safe food supply. Food safety starts with good design of equipment and facilities. Computing technology ties all food safety efforts together. When food is "on the road" a number of issues can arise. Content related to maintaining a biosecure facility can be found here. In today's world, businesses can't be too lax in letting unauthorized people into their facilities. Food fraud is a growing danger for processors and consumers alike. Review last year's power point presentations from the 2017 Food Safety Summit. Content for the farmers, growers and ranchers raising our food. Content geared toward processing, handling and packaging the food for our tables. How our food gets from processing to consumption safely. Food safety is critical just before the consumer receives product, plated or packaged. Articles covering the legalization, regulation, food safety, and trends of legal cannabis edibles and beverages.